New Snowden documents: The NSA is collecting millions of address books and being overwhelmed by all the spam. 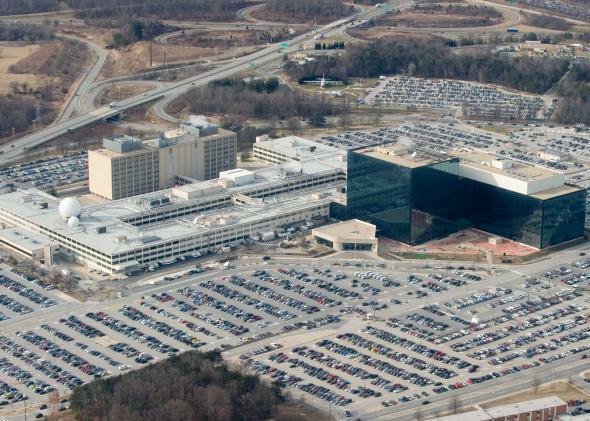 The National Security Agency headquarters at Fort Meade, Md., as seen from the air. In the latest article based on the Edward Snowden documents, the Washington Post’s Barton Gellman and Ashkan Soltani report that the NSA is “harvesting hundreds of millions of contact lists from personal e-mail and instant messaging accounts around the world, many of them belonging to Americans… in large numbers that amount to a sizable fraction of the world’s e-mail and instant messaging accounts.” These amount to hundreds of thousands of email address books and chat contact lists per day. NSA Director Keith Alexander has defended the practice of bulk data collection in the past, saying, “You need the haystack to find the needle.” But this latest program may revive the question of whether, privacy issues aside, the NSA is pouring way too much hay on the stack. Last June, one biologist who specializes in statistical analysis calculated that even using the most conservative estimates, there’s only a 1-in-10,102 chance that someone identified by the NSA’s PRISM program is an actual terrorist, a calculation endorsed by a former NSA analyst. If we do see a move away from bulk data gathering by intelligence agencies in coming years, I suspect it might have less to do with privacy concerns raised after the Snowden revelations than questions of whether this is really that efficient a way to gather information.